Containing quality ingredients and no artificial flavors, Monin premium Hawaiian island syrup is a quick and easy way to add new flavors to a variety of recipes! Add a splash of this Hawaiian island syrup to your popular cocktails and mocktails and it's sure to please your guests. The guava, passion fruit, and orange taste of this flavoring syrup will enhance the fruity profile of your mixed or blended drinks without overpowering them or being too sweet. You can even use this syrup for iced teas, lemonades, and tropical mai tais. Packaged in a glass bottle, this flavoring syrup makes an excellent addition to any restaurant, bar, coffee shop, or cafe. It boasts a sleek appearance for an attractive shelf presence and can easily be paired with a compatible pump for quick, efficient service during peak serving hours. Since 1912, Monin has had a passion for delivering premium products that simplify the beverage-making process. Their sense of innovation and creativity has led to a wide variety of flavors and recipes to suit any menu. 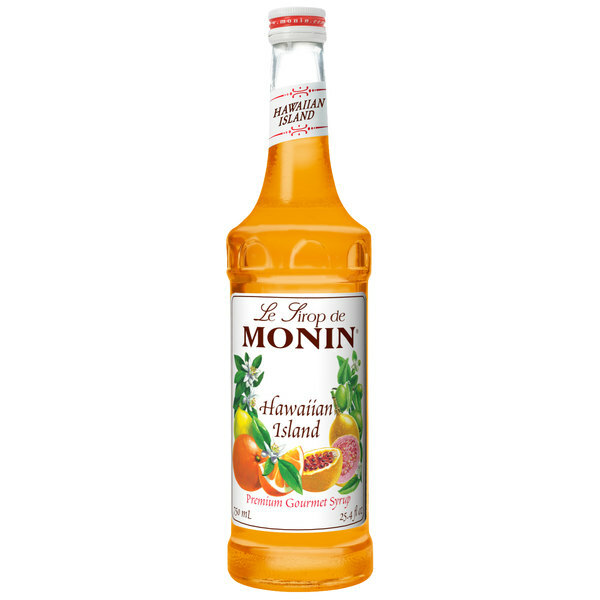 Use this Monin Hawaiian island syrup to craft superior beverages for your guests! What a unique flavoring syrup! This a amazing combination of my favorite fruity flavors. It makes for a very delicious shaved ice in the summer time. The Hawaiian island syrup is great for pouring over shaved ice for a delicious treat. A great, sweet flavor and so refreshing on hot summer days. This Monin Hawaiian Island Syrup is a very good mixer (sweet). It is concentrated allowing for a small amount to be used when mixing. Using it with a Mai Tai (sour) mixer and rum creates a great Mai Tai. This is a wonderful tasting syrup! I would describe it as a tropical taste that is pretty unique. You can name it anything tropical and it would do the job. This is a combination of guava, orange, and passion fruit. I prefer it over any of those three individual flavors. The balance of tart/sweet, and the balance of tropical fruit with citrus are both perfect. It makes a fantastic standalone italian soda or an awesome addition to cocktails. A great tasting Hawaiian Island flavoring syrup and really great for using as a shaved ice syrup. Love the great fruity flavors of the syrup. Really love the tropical nature of this fruit syrup. The flavor is sweet and bold and great for making fruit cocktails. The Hawaiian Island syrup is a great blend. It is not as strong as I would like it to be, but that is okay. It is still a fantastic syrup. It is now a favorite of mine and I use it all the time. A really nice quality fruit syrup from Monin that is awesome for flavoring our teas and lemonades. The Hawaiian Island syrup is amazing and very tropical. A great syrup for cocktails as well. The Hawaiian Island fruit syrup is bursting with a great tropical taste. The syrup is perfect for making tropical style frozen concoctions that are great for by the pool or summer specials at our pool side bar. A great tasting Hawaiian island flavoring syrup that is bursting with flavor. It is great for flavoring drinks or lemonades. We also use it to flavor our Hawaiian island cupcake frosting. We tried a lot of different brand's Hawaiian flavoring syrup, finally we decide to use this one. Great syrup with true fruits flavor. Love the glass bottle and its designove this for a summertime pastis! This reminds me of the Monin tropical blend flavoring syrup. Both are very good and tasty when similarly used. It has a tropical fruity flavor.